ANTIQUE AUTHENTIC BURKINO FASO OLD AFRICAN "BAW" DANCE MASK THAT SHOWS WEAR, SIGNS OF TRIBAL USE, AND DATES FROM THE 1800'S - 1900'S! THIS OLD RARE PIECE MEASURES APPROXIMATELY 22" X 18" X 6" IT'S A LARGE OLD MASK THAT HAS BEEN "DANCED!" IT FEATURES VERY FINE TRIBAL CARVING IN NEAR PERFECT CONDITION THAT HAS BEEN OVER PAINTED WITH WATER BASED WHITE AND RED PIGMENTS SEVERAL TIMES AS THE TRIBE RENEWS IT EACH SEASON WHEN THE BURKINO TRIBAL DANCE FESTIVAL OCCURS. 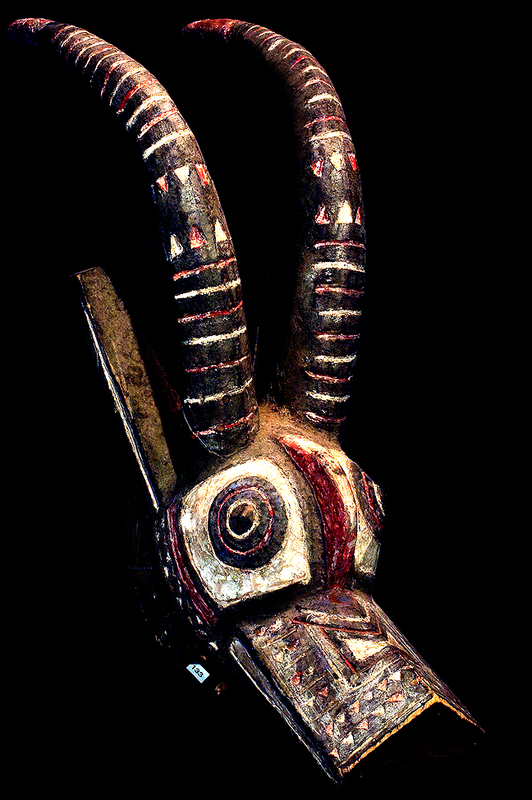 ONE OF THE HORNS ON THIS MASK HAS A TRIBAL REPAIR ON IT. IT'S A UNIQUE, GREAT, OLD PIECE.